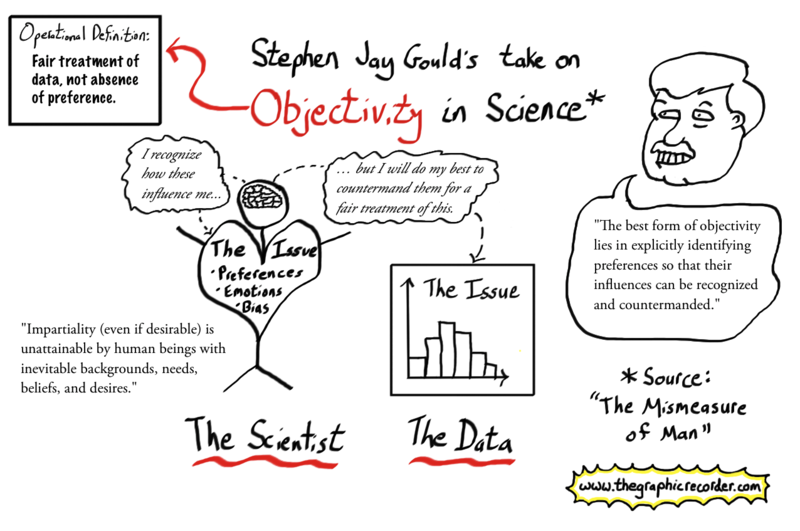 I have been reading Stephen Jay Gould’s The Mismeasure of Man (Revised & Expanded) a book that describes a very specific example of how scientists have used flawed statistics and faulty logic to provide support for a idea that tugged on the emotional strings of many: that intelligence is a measurable, genetically fixed quality (implication: different races have different, unalterable levels of intelligence). In the book he explains why this idea is entirely wrong. People often think that the core of science is complete objectivity. But we are becoming more and more aware that it is impossible to remain entirely objective – and Gould has therefore developed a more moderate approach. In the introduction to the second edition of his book, he explains his view. The sketch above is my visual take on his text (click on the image to view an enlarged version).